A graphic novel adaptation of Madeleine L'Engle's ground-breaking science fiction and fantasy classic, now a major motion picture. The world already knows Meg and Charles Wallace Murry, Calvin O'Keefe, and the three Mrs—Who, Whatsit, and Which—the memorable and wonderful characters who fight off a dark force and save our universe in the Newbery Award–winning classic A Wrinkle in Time. But in 50 years of publication, the book has never been illustrated. In the graphic novel, Hope Larson takes the classic story to a new level with her vividly imagined interpretations of tessering and favorite characters, like the Happy Medium and Aunt Beast. Perfect for delighting old fans and winning over new ones, this graphic novel adaptation is a must-read. A Wrinkle in Time by Madeleine L'Engle is now a major motion picture from Disney, directed by Ava DuVernay, starring Storm Reid, Oprah Winfrey, Reese Witherspoon and Mindy Kaling. Hope Larson is the author of All Summer Long, which was a Kirkus Reviews Best Book of 2018. 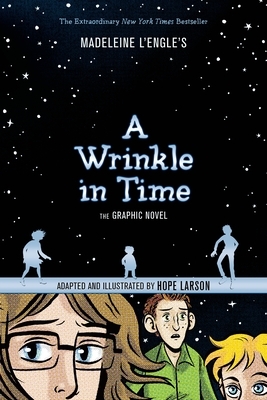 She also adapted and illustrated A Wrinkle in Time: The Graphic Novel, which spent forty-four weeks on the New York Times bestseller list and for which she won an Eisner Award. She is additionally the author and illustrator of Salamander Dream, Gray Horses, Chiggers, and Mercury, and the author of Compass South and Knife's Edge, both illustrated by Rebecca Mock. She lives in North Carolina.